Jajpur is a district of Orissa, India. Jajpur is famous for its historic place and pilgrimage which is at a distance of 122 km from Bhubaneswar the state Capital. Once upon a time Jajpur was the capital of Kalinga kingdom and had achieved the glory in archeological excellence. Jajpur is renouned for its natural resources, mines and industries. Situated on the bank of river Baitarani it has blessed with sacred shrine of Goddess Biraja (Durga), Sveta Baraha (incarnation of Lord Vishnu as the white boar), Sapta Matruka and a host of other shrines. It is famous for Saktipitha of Goddess Biraja. Jajpur: Jajpur is located at a distance of 92Kms from Cuttack. The sacred shrine of Goddess Biraja, Baraha, Sapta Matruka are situated in here. 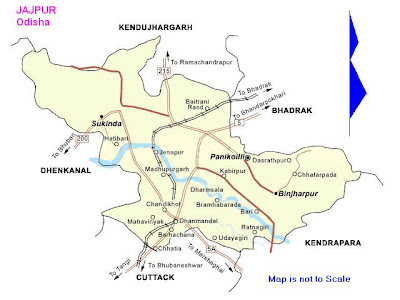 Jajpur town popularly known as Biraja Khetra, as the place sacred to Goddess Biraja, the symbol of Sakti (Power).It’s a small city surrounded by the river Baitarani by half circle and a high level canal at the other half. Chhatia: Situated at a distance of 35kms from Cuttack, Chhatia is famous for Lord Jagannath Temple. It is believed and popular floklore as the Lord Jagannath of Puri will be available at Chhatia in Avatar of Kalki during this Kali Yuga. Chandikhol: Chandikhol, which is at a distance of 40 kms from Cuttack, is an attractive picnic spot with natural springs. And famous for Transporation Point. Mahabinayak: At a distance of 2 kms from Chandikhol to the west, is situated the Mahabinayak (Shiva temple). The Tourists can enjoy its natural surroundings. Lalitgiri, Ratnagiri & Udayagiri: The three Boudh Vihars are at a distance of 70kms from Cuttack.The famous Buddhist Complex isbelived as the ancient seat of Puspagiri University, the buddhist university of 7th century A.D. Recently a statue of emperor Ashok is being discovered form Langudi hill. Duburi : At a distance of 38 km from Chandikhol towards Daitari mines on Express Highway is going to be one of the most famous city in Orissa as a number of Steel plants have been established here. These are Neelachal Ispat Nigam Ltd., Jindal Stainless., Mesco Steels.,VISA and a few others. Also TATA is going to build a huge plant here. give more detail with route map. thanks.